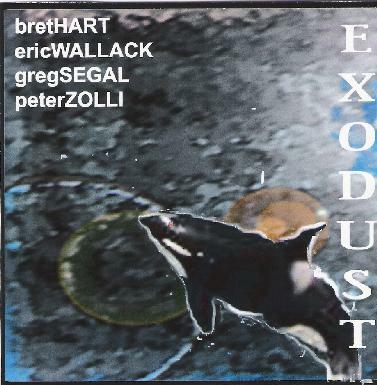 Bret Hart/Eric Wallack/Greg Segal/Peter Zolli - "Exodust"
Exodust is a 24 minute CDR-EP that brings together 4 veterans of the free-improv/homemade music underground with the intention of making progressive rock. The CD opens with the brief introductory "Antanas Lives! ", before really taking off with "My Own Pet Whales". Fans of mid-70's King Crimson's live show improvisations will really dig this. The music is very much in that spirit, though Hart, Wallack, Segal and Zolli put their own unique stamp on the sound. "Planet Up in Smoke" is a fun Grateful Dead meets The Magic Band tune. And "Those Who Were When" is a nice spacey atmospheric piece with a great combo of guitar efx and wailing leads. These five structured improvisations began in Bret Hart's studio in the South, where foundation tracks utilizing numerous instruments were recorded. Then Eric Wallack, in the Midwest, added his bass and Chapman Stick parts, which then traveled to the Pacific Northwest where Greg Segal added electric guitar and woodwinds. Things finally landed in New England, where drummer/percussionist, Peter Zolli, layed down his parts and did the final mix. Having been immersed in the avant-garde free-improv scene for so long these guys are uninhibited about stretching out in all sorts of directions, ultimately occupying a space somewhere in the middle of the King Crimson and Rock in Opposition progressive rock axis. I hope to hear more of their Prog adventures. For more information and to hear music from Exodust you can visit Bret Hart's Edge Surfing podcast site at: http://edge-surfing.podomatic.com.